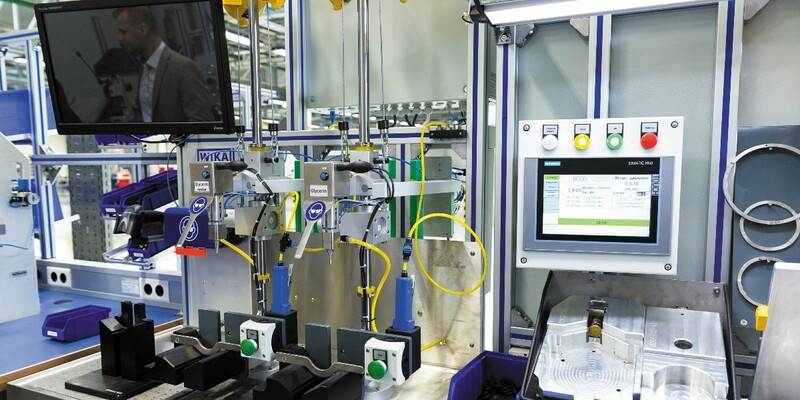 The German company WIKA Group (Russian subsidiary – WIKA MERA, JSC), a global leader in the manufacture of process measurement and control devices, has localized their production within the scope of the import substitution program in New Moscow. Durable and elegant, like a Swiss watch. That’s the kind of compliment often paid to the process measurement and control devices manufactured by WIKA. The company’s headquarters are located in Klingenberg am Main in Bavaria. WIKA has manufacturing facilities in Germany, South Africa, the US, Brazil, China, India, Switzerland, Canada, and Poland. As a recognized business segment leader, WIKA supplies all kinds of devices for measuring pressure, temperature, levels, flow, and force to over 100 countries. The range of products includes everything from manometers to thermocouples and metrology equipment. The company has been successfully operating in Russia for a long time. At the end of September, its Russian branch WIKA MERA, JSC, opened its own plant at the INDIGO industrial park in the Southwest of Moscow. One of the plant’s key slogans is “German quality, made in Russia.” Company owner Alexander Wiegand talked to Capital Ideas about the plant and WIKA’s plans in Russia. Mr. Wiegand, opening a plant in Moscow is a pretty brave move for WIKA in light of the current economic crisis, a weaker ruble, reduced purchasing power in Russia, and the sanctions. Why did you make the decision to localize production and what makes you confident in the future success of this enterprise? We made the decision to localize manufacturing because, first of all, in our line of work we are guided by long-term strategies that have potential, not by short-term strategies. It’s worth adding that in Russia, widespread trends all point to the fact that localizing production will be the only way to move forward and succeed on the Russian market. This doesn’t mean that we are planning to risk everything we’ve achieved in Russia so far. However, we hope to increases our chances of developing and strengthening growth potential with the help of this investment in the construction of our own plant in Moscow. Of course, this entails risks that you have already mentioned. There are still calls from the US to extend sanctions against Russia, which can negatively impact our business. At the same time, Russia is an interesting market that uses a lot of raw materials, oil, and gas. This is an important segment that uses our products and I believe this trend won’t change in the future. So our chances are still good. 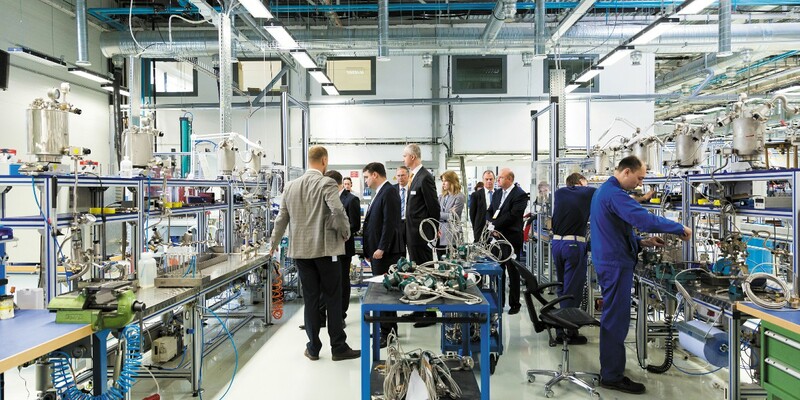 Is this plant WIKA’s first own manufacturing facility in Russia? Or does your subsidiary WIKA MERA, JSC have other manufacturing facilities? We were already engaged in manufacturing at our previous Russian location in the center of Moscow. We produced temperature sensors and other similar devices, for example, as well as media separators. We’ve now expanded our manufacturing of this technology, gave it a more professional status, and expanded the range of products we offer. Import substitution is a trendy word in Russia right now. By opening a plant in Moscow, you’ve kind of become a Russian manufacturer. Are you afraid of competition from other Russian manufacturers of process measurement and control devices? There will probably be more competition down the line. Competition is not as difficult, because our products were initially adapted for the Russian market. The same thing applies to supply deadlines, the needs of the local market, and local demand, where we have a lot of opportunities. So overall, we’re not afraid of competition. We see it as a challenge. What is WIKA’s key competitive advantage? There are a lot of points that could be brought up here, and all of them have equal merit. For example, one of our advantages is that we manufacture a wide range of products. Moreover, the quality of our devices is very high. We also do a lot of work on special orders, fulfilling specific client needs and wishes and offering a lot of options for different devices. Could you tell us a bit about the plant itself? What kind of equipment does it manufacture and in what quantities? The plant, which is a manufacturing and storage complex, produces thermocouples and resistance thermometers, stainless steel manometers, bypass level meters, membrane media separators, protective sleeves and flanges. I won’t cite exact numbers, but the plant can manufacture, for example, up to 1,000 level gauges, 400,000 manometers, 12,000 electronic temperature sensors, and 25,000 membrane media separators a year. We also have enough capacity to manufacture about 20,000 protective sleeves and flanges a year, but it depends on their size. Is all the equipment in your Moscow plant made from Russian parts, or do you ship parts from Germany? Individual parts come from Germany. We also try to get some parts from the Russian market, but this is mostly raw materials. But we get the main parts from Germany or from our other suppliers that operate across the globe. The manufacturing of German equipment, that is equipment of high quality, requires appropriate personnel. Where do you find employees, and are you satisfied with their qualifications? We find our employees here, but we put a lot of work into their training. For example, all the employees you saw at the plant’s opening ceremony went through a long training period at one of our plants. In Germany, for example, or in Poland, where we also have manufacturing facilities. Moreover, our colleagues from Germany regularly come to Russia in order to provide the necessary support for local employees. Are you only offering a wide range of process measurement and control devices in Russia, or do you offer services as well? We also offer services. This primarily concerns calibration. We have a certified calibration lab at our plant. Moreover, we offer installation services in cases where our devices have to be installed in specific ways. However, we primarily provide these kinds of services in other countries. But if we start to get more orders of this kind in Russia, we’ll start training our employees here for this type of work. And of course, we offer repair and maintenance services for our equipment. How developed is the WIKA MERA distribution network in Russia? We have been expanding it over the course of several years. There are 10 sales offices in different Russian regions, including in St. Petersburg, Saratov, Kazan, Yekaterinburg, Novosibirsk, Ufa, Krasnoyarsk, Samara, etc. We do something to expand our network every year and plan to continue expanding further. Are the plant’s manufacturing capacities exclusively designed to meet the demands of the Russian market, or do you plan to export some of your products? We plan to service all CIS countries from here, like Belarus, Kazakhstan, and others. But of course we are primarily targeting the Russian market. We are taking the needs of this market into account. How much did WIKA invest in this project, located across an area of 5,000 square meters? Expenses amounted to about 15 million euros. This amount includes the price of land, the buildings of the manufacturing and storage complex, and manufacturing equipment. Is this the final project, or do you plan to expand? It’s a bit soon to talk about this. First we have to fully master and use all the capacities that we’ve built. But, as you saw for yourself, we’re not fully using all the buildings in the complex yet. We’re currently using about 50-60% of the total space. So the idea for the next few years is to create additional manufacturing capacities and, of course, expand the ones we already have. Does WIKA have any plans for new investment in Russia? If so, then how soon should we expect these plans to be implemented and what will the main focus of these investments be? It’s difficult to say right now. If you told me how prices for oil will be set in the future and how the political climate will shift, I’d be able to give you a more definite forecast. For now I can say that up until 2014 our annual economic growth in Russia amounted to 20% a year on average. I suppose that if the political climate settles, if oil prices don’t drop or a at least stay where they are now or gradually go up, we’ll see our performance go up again. If this happens, then we’ll definitely fill up our manufacturing complex in Moscow in the next three to four years. And then we can think about moving on to the next stage: doubling manufacturing capacity in terms of expanding our plant. But I think we’ll have to be patient in order to achieve this goal. Can you imagine WIKA’s manufacturing capacities in Russia eventually replacing supply from Germany on the Russian market? Not completely, because there are always specific things or parts it doesn’t make sense to manufacture in several plants at once. On the other hand, we’re already capable of covering 40-50 percent of our needs, and I can definitely imagine that over time this figure will reach 60 or even 80 percent. When did WIKA come to Russia? How did you start? Were this difficult times, or did everything go smoothly? We started in 1995 by opening a representative office in Moscow. Soon, in 1997, it turned into our subsidiary, WIKA MERA. At the end of the 1990s, we were experiencing serious difficulties on the Russian market due to the financial crisis. We were deciding between leaving Russia or staying. And thank God we decided to stay, since we were growing rapidly over the course of several years afterward, which I already talked about. It was only in 2014, due to the crisis, the drops in oil prices, that we started experiencing some stagnation and decline. But we hope to overcome this in the nearest future and start growing again. What role does the Russian market play in WIKA’s overall strategy? Our turnover in Russia and the CIS amounts to almost five percent of WIKA’s total turnover all over the world. This number has been growing lately, and we think that the Russian market has a lot of potential for us. Especially considering the possibilities we now have after launching our plant in Moscow. So Russia is one of our markets for serious potential growth. of course, there are countries that are more important for us in this respect. China, for example, because a ton of money is being invested into infrastructure development there. But if we look at it from the European perspective, I think that Russia is a growing market with a lot of potential for us. In your opinion, is the Russian market still attractive for foreign businessmen? Again, it’s hard to say for sure because it’s difficult to tell how things will be developing in the future, considering the US has decided to impose more sanctions on Russia. But I hope and am confident that the political climate will settle in the future and that there will be new great opportunities for doing business in Russia.